Another great one gone. So sad. It’s been a rough several months for music elders, starting with the loss of Earl Scruggs in March, then Levon Helm in April, Duck Dunn two weeks ago, and now the amazing guitar genius: Arthel “Doc” Watson. 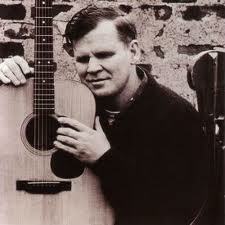 As usual, there are plenty of formal obituaries out there, so I’ll just touch on what Doc Watson meant to me. The first recording I ever owned of old-time country music was Doc’s 1975 album Memories. I obtained it in the mid 1990s, at almost that exact same time I met some neighbor musicians, two banjo players and a flatpicking guitar player, all of whom were into old-time country and bluegrass music, and so began my immersion in that particular brand of American roots music. I still have lyric and chord sheets of about half the songs from that Memories album, I pull them out whenever I’m jamming with my old-time friends, and another song Doc did, Way Downtown, on the 1972 Will The Circle Be Unbroken album, is my go-to tune for when it’s my turn to lead a song and nothing else comes to mind. Doc was a true virtuoso who could play with lightning speed, but also with achingly beautiful subtlety, as in the contrasting clips below. That he was blind since the age of one is almost impossible to believe, and at times reason enough for someone struggling to learn the guitar to just give up. Thanks, Doc, for all of the wonderful memories and music. Thanks for sharing. So sad. It has already been a rough year of loss in the musical circles this year. Thank you for the heartfelt post.